Journeying to the beautiful and unspoilt Argyll coast, the epicentre of the origins of Scotland in Dalriada, we’ll follow in the footsteps of St Columba. This tour traces the saint’s earlier travels, exploring a cave and ruined Celtic chapels standing in isolated splendour set amidst the ancient Neolithic world of stone circles. The tour continues with a visit to the spectacular islands of Mull & Iona and on the long trip, will lead up the Great Glen to a hill fort, Loch Ness and Pictish stones. COST: £481 pp based on two sharing a room and subject to availability, including B&B accommodation, ferries, all transport and Mountain Leader guide, but excludes food/drink. Single supplement: £531 for the whole package. Depart Glasgow 09:30, drive to the foot of Dumbarton Rock – capital of the Strathclyde Britons and then north to Loch Lomond, stage of a daring Viking raid. As we pass through the Arrochar ‘Alps’, there will be photo opportunities. Coffee in the white-washed town of Inverary. St Columba’s cave and picnic on the beach and onto some atmospheric Celtic chapel ruins with finely engraved stone slabs. Kilmartin Glen with its prehistoric cairns, standing stones and cup and ring markers. Grading: Easy along paths. Distance: Not more than 2kms, depending on how much you want to see. Height gained: negligible. Arrive at a superb accommodation on a private estate. Ferry to Mull and drive across the south of the island to reach the ferry to Iona for lunch. Walk to the Abbey church, the existing structure spans the 13-16th centuries. View the iconic high crosses; the Augustinian nunnery, the tombs of ancient kings and more. Drive to Bunessan and walk to Kilvickeon beach, visiting a ruined chapel and an old hill fort Distance 3kms 92m - easy but boggy in sections. Drive to Lochbuie, ranking among Mull’s finest scenic places and certainly quiet and unspoilt. Walk 8kms ascent 38m along easy tracks to visit a medieval castle, an ancient stone circle, a chapel and a mausoleum, along a fine section of coast backed by impressive hills. COST: £636 pp including B&B accommodation, ferries but excludes food/drink, transport and Mountina Leader guide, based on 2 sharing a room and subject to availability. Tracing the beginnings of Columba’s time in Scotland in the Kingdom of Dalriada of the early Scots in the picturesque natural setting of Scotland’s west coast. 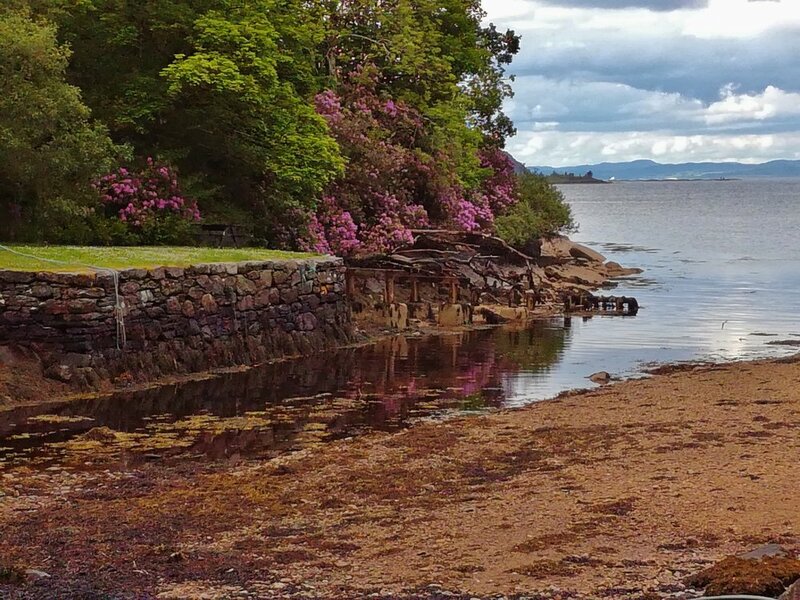 The 4 day tour has more time for walks to explore Argyll’s superb and not that frequented coastline, maintaining its unspoilt and unhurried charm. The trip culminates with crossing the sea to Mull and on to Iona to its ancient abbey in its out on the edge setting. Depart from Glasgow at 09:30. Journey up Loch Lomond and around the base of the stunning peak of The Cobbler and over the pass of Rest and be Thankful and a fine descent to the shores of Loch Fyne and morning coffee in the white-washed town of Inverary. Lazy option for those not wanting to climb the hill is to take a tour around this stately home of the Campbells or saunter around the picturesque white-washed town by the sea loch. Continuing on our journey along Loch Fyne, we’ll drive the solitary shores of a sea loch to St Columba’s atmospheric cave. Take up accommodation for a 2 night stay. 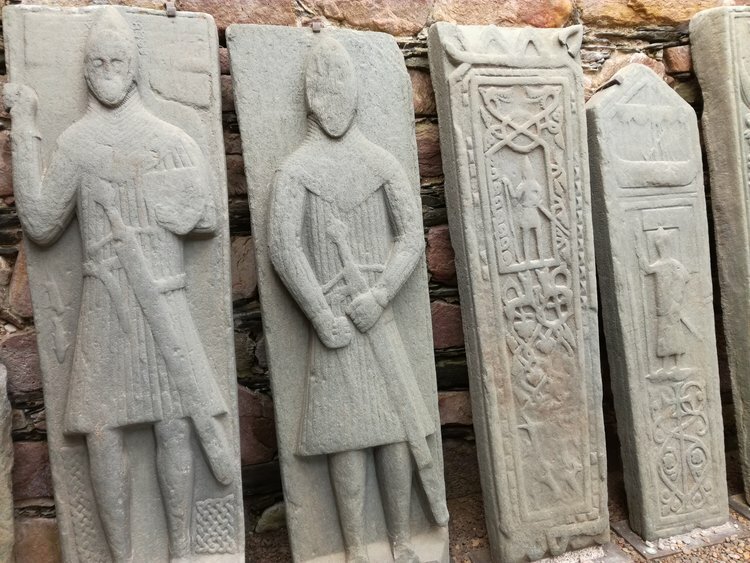 Drive to the Celtic chapel at Kilmory and see impressive, engraved stone slabs and appreciate the the Celtic saints connection with nature in this lovely setting. Walk section of the mysterious Kilmartin Glen to see a Neolithic landscape littered with tombs and standing stones. Grading: Easy along paths. Distance: Not more than 2kms, depending on how much you want to see. Height gained: negligible. View the engraved stones in the yard of the Kilmartin kirk. COST: £1,139 pp based on two sharing a room and subject to availability. Cost includes all B&B accommodation, all ferries, transport and Mountain Leader guide, but excludes food (other than breakfasts) and drink. Single supplement: £1,399 for the whole package. Although the theme is about connecting with the places associated with Scotland’s apostle and telling his story, we’ll explore regions rich in scenic beauty and tranquillity and a culture steeped in pagan history. This journey explores the quiet and beautiful Argyll and some of its islands including Mull and Iona, then ferrying on to mainland at Ardnamurchan, by which time we’ll have seen half of the exceptional west coast of Scotland. Via Scotland’s ancient trade route, The Great Glen, we’ll travel the shores of Loch Ness to Inverness, before heading south back to base by the Cairngorm mountains. Same as described on the 4 day tour. Drive to the ferry to cross over to Ulva for walks through the woods and along the coast to appreciate the rural history and geology of the island. Drive up to the NW corner of Mull for a coastal walk to the raised beaches with views out to the Treshnish Isles. Short walk in the attractive forest through to Loch Ba. Evening meal out in a local inn. Drive up to Tobermory and ferry across to the Ardnamurchan peninsula. Visit the Church of St Mary & St Fillan in what has to be a contender for the most beautiful setting of any church in Scotland. Visit the Jacobite exhibition at Glenfinnan. Up the Great Glen along the quiet eastern shore of Loch Ness for accommodation for two nights. Dine at an inn and back to base. Drive south to the Cairngorms. Over the Drumochter Pass to Pitlochry with a stop to visit the Cathedral town of Dunkeld and a riverside walk to the Hermitage. Grading: Easy round walk of 1km along the level. Late afternoon drop off in Edinburgh. You could make this a 4 day option by leaving the party at the end of day 4, making your own way from Craignure on the ferry and train back to Glasgow/Edinburgh. Cost would be the same as the 4 day option.